Escape the crowds of Kailua-Kona by heading up to Kaloko, on the slopes of Mount Hualalai. 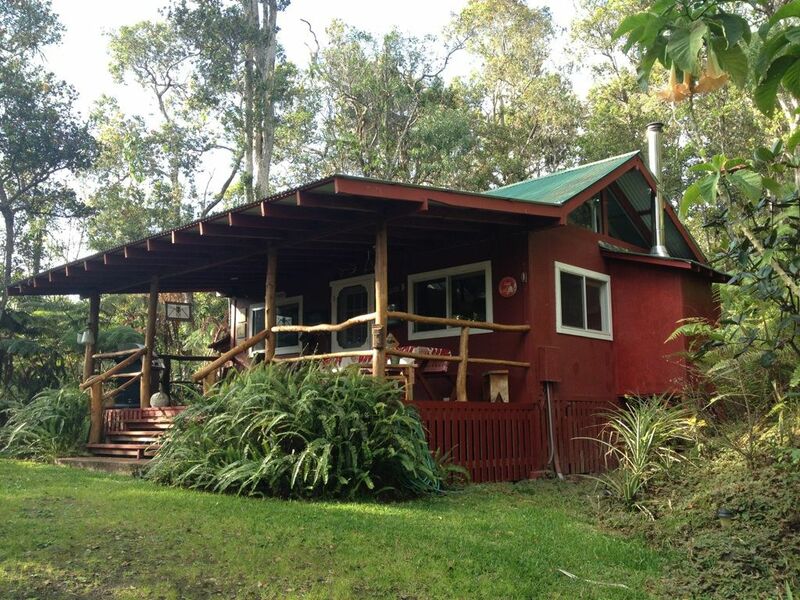 This cozy, rustic stand alone cabin is situated on 5 acres and is surrounded by native ohia trees and ferns. Kick back on the porch or take the beautiful trail hike just up the street. Soak in your hotl tub! Enjoy cooler weather and the Incredible location! 10 mins to town, beaches and airport. Large studio, washer/dryer, full kitchen, queen size bed and additional queen in loft; both with heating blankets. Cooler mountain weather; so socks and light jacket are recommended in the evenings. This mountain climate is at least 10-15 degrees cooler than down at sea level. Let us share this piece of paradise with you!! CHECK OUT OUR ADDITIONAL COTTAGE ON THE SAME 5 ACRE PROPERTY! GREAT FOR EXTRA FAMILY MEMBERS #383182. ** Featured on HGTV's show Tiny House Hunting (Fall 2015). *Booking.com award winner 9.1 rating! 4G high speed internet. Free unlimited wifi! large front deck with gas grill and picnic table. Private hot tub on your own private deck under the stars! Cabin sleeps up to 4 for an additional charge ($15 per person per night) 4G high speed internet. Free unlimited wifi! We fell in love with Carson’s cabin!! Wish we could have stayed longer. If we are ever back in kona we plan to stay there again! What fun! If you like nature and quiet forest walks this is the place for you. I enjoyed the cooler climate of the cloud forest but with an easy drive to all the beaches of the coast. I am missing my visits from the chickens in the morning and my hot tub under the stars, serenaded by a chorus of cocci frogs. Ah wish I were there! Leaving the last 5 days of our 2 week Maui vacation for a relaxing Kona, Big Island mountain rainforest hideaway, was the perfect ending to an action-packed trip. Being 10 minutes to the coast and shops, including a Costco made our remote getaway easy to enjoy. We made use of the private jacuzzi area, and the outdoor patio with barbeque and outdoor table. We thoroughly enjoyed the hens roaming around and visiting. The cabin was a perfect size for us both to relax. We enjoyed using the mezzanine level beds for reading in the mornings and enjoyed using the kitchen to cook in evenings. We accepted Caroline's suggestion of taking a short walk outside the property to a 3-mile hike up the street, as well as a Mountain View Coffee House visit with free tours on the hour. We were able to see and handle the friendly Jackson Cameleons sitting on the ginger orchids right outside the cabin. Upon arrival it was a special surprise to have a bowl of free-range eggs in the refrigerator for our bodies to enjoy. Caroline went out of her way to ensure we were completely comfortable, pointing out the fans, humidifier and electric blanket if our temperature needed adjusting. More importantly Scott and Caroline embodied the Hawaiian spirit of family and we were welcomed with open arms and hearts, even ensuring I frequently had a flower behind my ear. Take me back to the Carson Treehouse, I'm in love. Recommend it to anyone. This was the perfect place for our small family’s vacation. They had everything we needed and some things we didn’t know we needed. It was wonderful to be able to escape the heat since being up on the mountain meant cooler weather. The bed was comfortable. The surroundings were beautiful and every morning we were greeted by some silly and friendly chickens. 8 miles from Kailua-Kona airport, 40 mins to Waimea/Parker Ranch, 30 mins to City of Refuge, 2 hours to Volcano National Park. $180 per night for one or two nights; plus 14.42% tax and $85 cleaning fee.Guests can book directly with owners. Require a $100 deposit ahead of time to hold reservation.